Reflections from Palestine: A Journey of Hope. A memoir by Samia Nasir Khoury. Samia Nasir Khoury celebrated her eightieth birthday on Sunday, 24 November 2013. This was also the final day of the Ninth International Sabeel Conference. Following a service at the Lutheran Church of the Ascension at Augusta Victoria on the Mount of Olives, the 200 delegates renewed our commitment to justice and peace at Qasr el Yahud, the Baptism site on the Jordan River before going to the Intercontinental Hotel in Jericho. There we were joined by an additional 200 Sabeel members for an afternoon of celebrations to mark the twenty-fifth anniversary of Palestinian Liberation Theology. As Samia noted in an email to friends shortly after the conference ended, never had she experienced so many people singing happy birthday to her. 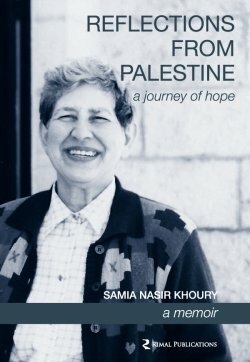 It was especially fitting that this book was available for purchase that afternoon as so much of the story goes to the heart of Sabeel’s work in developing and practising Palestinian Liberation Theology. Together with her long time friends—Cedar Duaybis and Jean Zaru—Samia Khoury has been one of the founders of Sabeel. These strong women of Palestine have played a leading role in the organization and their lives radiate with the virtue of summud, steadfast persistence. In the face of occupation and never-ending harassment, these women and their millions of anonymous Palestinian compatriots stand firm and refuse to oblige the Zionist dream by fleeing the land of their ancestors. This book is both easy to read and hard to read, all at the same time. It is a gentle book as one articulate and passionate woman tells the story of her family through decades of occupation and hardship. It is a confronting book as the unremitting evil of the occupation is parsed out in the details of everyday life under belligerent military rule. Yet this is a woman who has raised a family and cared for her grandchildren. I have met one of those grandchildren, and she is every bit as articulate and determined as Samia herself. In addition to her life as a wife, mother and grandmother, Samia has served as a founding Trustee of Birzeit University, a founder of Sabeel, and the President of the YWCA in East Jerusalem. Her personal circle of contacts around the world is a testament to her character and stamina, and this book had its genesis in a series of essays written for the magazine, Witness. I am glad that she wrote those essays and even more pleased that she agreed to edit them into this collection of reflections. Her personal integrity shines through these pages. I hope this book is widely read and, more importantly, that it inspires us all to do more to end the occupation that diminishes the humanity of the Jewish occupiers as much as it harms the Palestinians. This entry was posted in Sabeel and tagged Palestine, Samia Khoury, summud. Bookmark the permalink.